Sri City, July 27, 2017:- Sri City has added yet another award to its array of impressive accolades by winning the prestigious ‘Vibrant & Fastest growing Industrial Park In India’ Award from the Associated Chambers of Commerce and Industry of India (ASSOCHAM) at the 11th International Summit of SEZ & Industrial Parks held in New Delhi, on Wednesday. 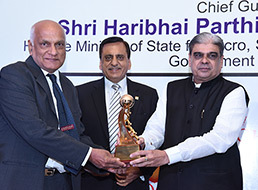 Mr. Ramesh Subramaniam, President, Sri City Foundation received the award and a citation from Mr. Haribhai Parthibhai Choudhary, Hon’ble Union Minister for Micro Small & Medium Enterprises. Commenting on the award Mr. Ravindra Sannareddy, Founder Managing Director, Sri City said, “We are extremely happy to receive this award from ASSOCHAM. This recognition serves as an endorsement for the high standards adopted by Sri City to emerge as a leading industrial & business city in the country. “This is no mere coincidence, but a recognition for the hard work and unique thought process of our team, ” he added.